Equal rights is a concept which, compared to the length of human civilisation, is a new idea. For many thousands of years, people have been discriminated against, on the basis of gender, age, sexuality, race and disability. It is only in very recent years that attitudes have started to change, first with gender, then slowly but surely, with the other issues. But the problems of equal rights remain, because, despite the law, old-fashioned attitudes pervade, and are still being passed down form generation to generation. Unless there is a complete change in mindset among all aspects of society, true equal rights still seem a long way off, even in a relatively liberal society such as the UK. 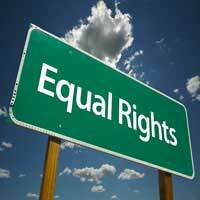 Equal rights is the granting of basic human rights to everyone regardless of any of the above factors. The concept of equal rights stretches a little further than this though, and suggests everyone should be treated the same, regardless of these factors. This can include equal pay in jobs and equal chance of promotion. It can also include the right not to be discriminated against because of personal choices or gender, age and sexuality. Most people think of equal rights and think of gender based equality. Ever since the Suffragettes campaigned for women to be able to vote, equal rights based on gender has been an issue. And even in the UK, equal rights is still an issue. Although employers are now not allowed to discriminate against women on the basis of their gender it still goes on. New research coming out all the time proves women still earn less than men, even when in jobs of equal standing. Women are still less likely to be made CEOs of major companies – and are still asked at interviews if they plan to have children in the near future. Some women suffer discrimination when returning to work after maternity leave. There is obviously a reason for all of this – it costs employers money when women do take their maternity leave. However, as it is the only way the human race will continue, it seems rather unfair, to say the least, that women should be penalised for wanting to start a family and hold down a career. Attitudes are slowly shifting, in the UK at least, and the more women who climb the corporate ladder, the better this will be. In some countries however, equal rights or the lack thereof, are tied in with religion, and are a lot further from ever becoming a reality. In some countries women are not even allowed to be alone with men not in their family, let alone work. The concept of equal rights for people regardless of their sexuality, race, disability and age is a rather newer one than that of equal rights for women. Each has its own specific set of challenges and problems it faces. For example, for most people, racial prejudice is so taboo that they would never exhibit that attitude. However, in some people and corners of society, sickening racist attitudes run so deep that it is frightening. Jokes about someone’s race are no longer acceptable. A less sinister form of discrimination is ageism. There are still plenty of jokes made about age – but this does not mean that it is any less a form of discrimination. Recently, in the UK, new age legislation has come in to prevent employers not giving equal rights to older people. Here, the shift needed is different; it is something which is needed to stop people thinking it is acceptable to mock someone for their age. However a balance must be found between not being able to joke at all and allowing hurtful comments which the perpetrator thinks are funny.Sexuality and disability equal rights will be tackled in other articles such are the depth and breadth of issues which go hand in hand with them. But really, equal rights should be a simple matter. Everyone should be given the same opportunities and the same access to the same freedoms regardless. That means regardless of anything – there is nothing which should stop a person from being treated exactly the same as the next one in line, with notable exceptions including a convicted criminal or someone who may be a danger to others.